Ever wondered what fantasy noir would be like, with dragons, elves, halflings, dwarves and zombies? Matt Forbeck presents exactly that scenario in his latest self-published novel, set in his Shotguns & Sorcery RPG setting. The novel focuses on former adventurer and treasure hunter Max Gibson as he investigates the brutal deaths of one of his dead friend’s family members. Events lead him beyond the walls of the Dragon City, and even to the Dragon’s Spire at the heart of the city, where it’s ruler holds his court. As with any and all of Matt Forbeck’s work, his characters are excellent. Max Gibson makes for a wonderful protagonist with a distinct cynical personality and a flair for the tongue-in-cheek. Matt builds him up really well throughout the novel, and gives him some great dialogue as well. Captain Yabair of the Dragon Guard, Max’s former lover Bellezza Sanguigno, Max’s former adventuring partner Moira, and all the characters that populate the novel are all just as fantastic characters. I really liked the tense professional relationship between Max and Yabair. A buddy comedy starring these two would be awesome. Dragon City, whether beyond its walls to the zombie hordes or within to the Dragon’s Spire, is a wonderful setting. I really like the mix of gunpowder weaponry and magic, which makes for a really good change from most other fantasy novels that I come across in my reading. Some really wonderful sights and sounds in the city, and it also has a very rustic, frontier town feel to it. I’d love to read more about the setting! 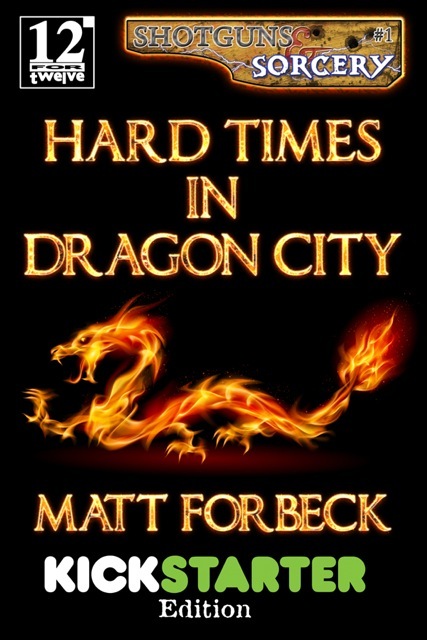 With some great pacing, a very exciting murder mystery, an even more excellent detective-protagonist, I can say with confidence that Hard Times In Dragon City is an amazing novel. As is my usual complaint with Matt’s 12-for-12 novels though, I really wish that these novels were longer! Posted on December 20, 2012, in 2012 Reading Challenge, 2012 Writing Challenge, Book Reviews and tagged 12-for-12, 2012 Reading Challenge, 2012 Writing Challenge, Advent Reviews, Book Reviews, Fantasy, Hard Times In Dragon City, Matt Forbeck, Self-published, Shotguns & Sorcery. Bookmark the permalink. 5 Comments.